With all of the buzz surrounding the Xbox 360's controller-free motion gaming of Kinect and the Playstation 3's motion-sensing Move, it might be easy to forget that Nintendo has been doing motion gaming for quite some time. They're still doing it, of course, and quite well. There were at E3 a whole new crop of motion games unveiled and showed off for the Wii. I was surprised to discover how fun Mario Sports Mix, due out next year, was. The game includes basketball, volleyball, dodge ball and hockey. 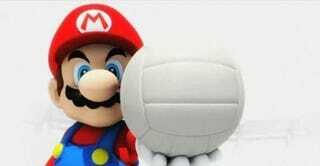 I spent a few minutes with a Nintendo rep playing volleyball and really enjoyed my time with the game. All of the games let you play cooperatively with up to three people or competitively with up to four. But we played through a match of cooperative volleyball together with the rep controlling Mario and me in control of Donkey Kong. The game's controls are fairly simple. To serve you swing the remote up into the air to toss the ball into the air, and then back down again to smack the ball over the net. Once the game gets going, you use the thumbstick on the nunchuck to move your character around. A glowing spot on the ground shows you where the volleyball is headed. You have to move your character into the glowing splash of color and then swing up to bump the ball. The game automatically aims the shots and you seem to have to bump the ball twice before delivering a spike by swinging down with the remote. Of course the game play has a Nintendo twist: While playing you can pick up items like Koopa Shells and coins to use during play. The attack items can be triggered during the match to knock down, blow up or confuse the other team, while the coins collected during a service multiply the score you receive if you win a point. So if you collect three coins during a volley and then win, you get three points not one. You also have super moves, which can be charged up with volleys. Mario's was a power spike, while Daisy's covered our entire court in flowers, making it impossible to see where her hit was going. The game also features a number of different settings, all based on famous Nintendo game locations, and all interactive. Which is a nice touch. While I didn't have time to try the other sports, I'm told the play is all very similar. It's nothing intensely deep, but it is fun and most certainly the sort of game that could be a big hit at family gatherings or with crowds of friends.